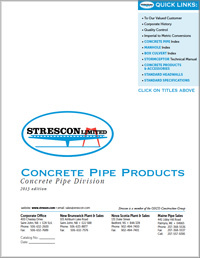 Precast concrete box culverts are available in various standard sizes from 6'-0" x 3'-0" to 12'-0" x 12'-0", which can be installed in single line or multi line applications. 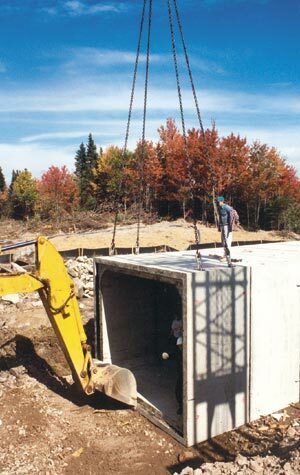 The box section offers a very simple fast installation on site and can become a roadway or be buried in deep fill situations. Strescon's use of fish weirs benefit fish, by providing resting places as they travel through the box culvert. Head walls are used to stop any material from getting into the waterway. Cut off walls stop the earth from washing out around the box culvert. Beveled and flared end sections help to collect and release the heavier flows of water when required.